A helicopter crash that killed three members of a film crew working on a reality show for the Discovery Channel early Sunday morning was California’s worst film set accident since 1982, the Los Angeles Times reports. That was the year Vic Morrow and two child actors were killed when a helicopter crashed into them while filming the Twilight Zone movie, an accident that gave rise to new safety standards in filming. 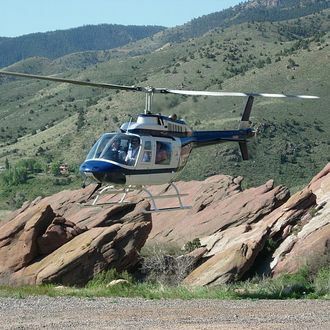 The cause of Sunday’s crash of a Bell 206B Jet Ranger at the Polsa Rosa Movie Ranch still hasn’t been reported, but according to the Times, the crew’s permit from FilmL.A. gave it permission to film a helicopter taking off and landing from 5 p.m. Saturday to 7 a.m. Sunday. The permit listed the show as “Unnamed Military Project” and the production company as Eyeworks, formerly 3 Ball Productions, which also made Biggest Loser and Discovery’s Flying Wild Alaska. The Times had just reported last month about the hazardous working conditions on reality T.V. shows, which are apparently finding it increasingly hard to get insurance as they pursue ever-riskier shows in ever-more remote locations such as Alaska and the Amazon. But this accident took place about 130 miles from Hollywood, so clearly this kind of work can be risky anywhere.